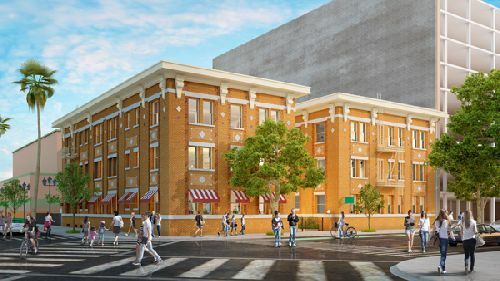 A landmarked building from 1914 in the City of Santa Monica is about to undergo a complete restoration and adaptive re-use construction project. The three-story building is located at 1305 2nd St, at Arizona Ave, a prime corner in the extremely desirable, downtown heart of the beachside city. The project is being overseen by architecture firm KFA, on behalf of the property owner/developer, Wilshire Skyline, in partnership with Kings Arch Inc. The renovation of this building will serve to reactivate a corner of Downtown Santa Monica that has long sat dormant. The building is long overdue for the renovation, which will provide new spaces for commercial office tenants. The exterior changes include adding ground-floor window awnings, providing new landscaping around the property, and rehabilitating the exterior brick finishes and site paving. The existing windows will be retained and rehabilitated, as well as the cornice and corbel details along the roofline of the building, which will be repainted and repaired as required. A new roof deck area will be established adjacent to the existing penthouse, which will provide an amenity for future commercial office tenants. In addition, the surface parking lot at the rear of the complex will be updated to provide two loading spaces and an accessible parking space, as well as 10 tenant parking spaces.